Welcome to Day 2 of #30DaysofRomComs! My entire fall is basically just one giant countdown to November 25, when Lorelai and Rory return to my life (and then I get to binge Lauren Graham’s new book). In fact, when I realized that I’d be in Ohio with my husband’s family over Thanksgiving, thus making it probably impossible to binge the show, I literally shouted NOOOOOO!!!!!!! My relationship with Gilmore Girls is deep and goes back to the very beginning. I watched the pilot episode when it originally aired on television, and then proceeded to watch every single episode for the next 7 seasons. I sobbed at the finale, feeling pretty cheated that we [spoiler alert!] weren’t going to see a resolution with Luke and Lorelai (I need a wedding, people!). And so for #30DaysofRomComs, I had to check in with my favorite ladies and count down my favorite romantic moments from the series. Are you ready? If you haven’t watched the complete series, warning! Danger! Here be spoilers! No, there will not be a Dean scene on this list. Dean is a yawn come to life, and while he was a perfectly nice first boyfriend for Rory, he does nothing for me. So my pick for romance in the early years was definitely Dave Rygalski. And peak Dave was this moment when he showed up to ask Mrs. Kim if he could take Lane to prom in Season 3 Episode 20: Say Goodnight Gracie. 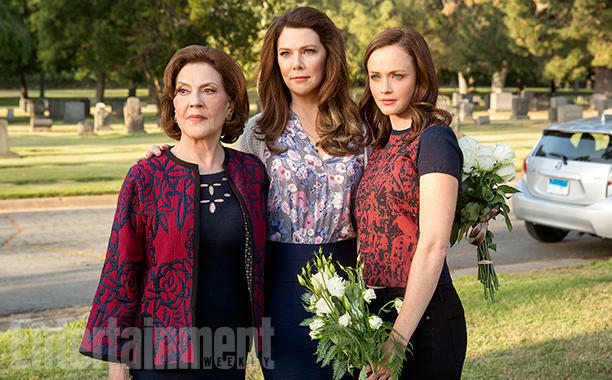 It has everything we love about Gilmore Girls: fast talking, cultural references, and subtle humor. I’m pretty sure if you listened hard on May 18, 2004, you’d have heard a collective SQUEE across America as Luke and Lorelai finally finally FINALLY kissed. Us die hards had seen the chemistry between the two of them from that very first episode, but damn did the writers take the scenic route to get there. We had to wait through four seasons of Max Medina (snooze) and Jason Stiles (who I loved, but it was never gonna work). And when we finally got here? Turned out it was well worth the wait. You guys, I’m gonna need a moment to collect myself before we go here. Because Edward Hermann’s death still seems like a cruel trick. I’ve already started stocking up on Kleenex for the revival. especially after this shot was released. I love Richard and Emily’s relationship, from the season 1 declaration that she demands to go first (oh god, the tears are already starting) to the story of their first date in season 3 on a visit to Yale. But this moment really captures what I love about their relationship, how despite the fact that these are two very staid people, they do have a playfulness about it. Alright, here it is, folks. The declaration. Despite my love of Jess and desire for them to get together NOW, I think … I’m Team Logan. Yeah, he made some mistakes, and [spoiler!] he should have known better than to propose and issue an ultimatum like that (DO YOU KNOW RORY AT ALL?!?!). Everything I love about their relationship is wrapped up in this moment, which is several episodes before they even get together. But their chemistry is on FIRE here, and we see exactly why she needed Logan (ugh, we will ignore the ill-advised Dean repeat/detour). Can I also say that I freaking LOVE The Life and Dead Brigade, and I’m so psyched to hear that they get to do some stunts in the revival! Despite the dudes, I think Gilmore Girls is all about family: the family you’re born into and the family you make yourself. And nothing sums up that theme better than the end of the series finale. Sure, I’m still pissed that we didn’t get a Luke + Lorelai resolution (which I hope will change in November! ), and it’s not Amy Sherman Palladino’s last four words, but I truly believe this was the perfect way to end the series. If you didn’t cry watching this, I don’t even wanna know ya. Are you psyched for November? While you’re waiting, throw on a rewatch, follow gilmoregirlsonly on Instagram for updates on the revival, and peruse the shop at Kindred Handicrafts for an awesome Gilmore Girls-inspired tee (I’ve got this one on its way to me as we speak). Mark your calendars for Sunday! I’ll be watching one of my all-time favorite rom coms, You’ve Got Mail, and livetweeting using the #30DaysofRomComs hashtag. Join me! It’s available free on Amazon Prime or for rent on iTunes or GooglePlay for $2.99. Cue it up on your platform of choice at 7pm. Wanna win your own In OmniA paratus tee from kindred handicrafts? Tweet about this contest, then come back and comment with a link, and you’ll be entered to win this tee in the size of your choice! That came out wrong! I clicked on your book because of your good taste and pre-ordered because it looks great! I hope that you have the most lovely day!! I missed the contest, but I wanted to share with you my Gilmore Girls revival wish. Rory lives in DC with Jess. Rory wowed Obama while on the campaign trail and she’s working for him doing something. Jess is a NYT best selling author. They’re both busy since Rory is being Rory and Jess is often traveling promoting his books. With Obama’s second term coming to an end, Jess decides it’s finally time to settle down. He proposes to Rory in private and not at some party. Then they get married in Stars Hollow. I have a scenario for Lorelei and Luke, but I’ll leave that for another day.